Prototype Politics offers a history and analysis of the two U.S. political parties and their affiliated organizations from 2004-2014 that documents and explains their differential uptake of technology. 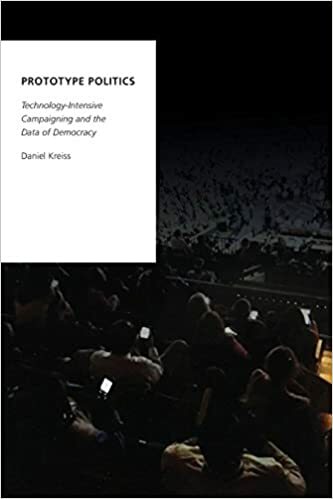 The book provides an analytical framework for understanding why and how campaigns are newly ‘technology-intensive’ and digital media, data, and analytics are at the forefront of contemporary electoral dynamics. The book discusses the importance of infrastructure, the contexts within which technological innovation happens, and how the collective making of prototypes shapes parties and their technological futures. Drawing on an innovative dataset of the professional careers of 629 staffers working in technology on presidential campaigns from 2004-2012 and data from interviews with more than 60 party and campaign staffers, the book details how and explains why the Democrats have invested more in technology, attracted staffers with specialized expertise to work in electoral politics, and founded an array of firms and organizations to diffuse technological innovations down ballot and across election cycles. Taken together, this book shows how the differences between the Obama and Romney campaigns on display in 2012 were shaped by the two parties’ institutional histories since 2004, as well as that of their extended network of allied organizations. In the process, this book argues that scholars need to understand how technological development around politics happens in time and that the dynamics on display during presidential cycles are the outcome of longer processes. Images created by Adam J. Saffer, Ph.D., using NodeXL Pro. My graduate students and I paired Federal Election Commission and other data from the nonprofit Democracy in Action site with LinkedIn data to trace the hiring patterns of campaigns and professional careers of every technology, digital media, data, and analytics staffer we could identify from 2004-2012 (N=629). We found that Democratic Party primary and general election campaigns hired 507 staffers in the areas of technology, digital media, data, and analytics compared with 123 Republican staffers during this time period (one staffer worked on both sides of the aisle). Democrats not only hired more staffers, they also had much higher rates of firm founding after presidential elections by these technology, digital, data, and analytics staffers. From 2004 through May 2014, Democratic staffers in these domains founded 67 firms and organizations, compared with 15 firms and organizations on the Republican side of the aisle. Take together, this reveals that the Democratic Party from 2004-2012 (and likely through the 2016 cycle) had a much more developed infrastructure, consulting ecosystem, and ‘farm team’ of staffers for its campaigns to draw on. To take but one example of these firms and the role they play in the diffusion of campaign strategies and technologies, the Obama 2012 director of analytics Dan Wagner founded the data and analytics firm Civis Analytics after the election, and was joined by over one-third of the 54 person analytics team on the campaign. Civis Analytics offers a host of applied data science services, including market research, predictive modeling, and an analytics platform, for a range of Democratic party-affiliated political clients and commercial firms. This matters because parties have limits on what they organizationally and legally are set up to do. As a general approach, organizations founded closer to the electoral cycle appear to the left or right of the campaign logo. Organizations positioned below the campaign’s logo were generally founded later after the cycle. Due to layout limitations, firms could not be positioned spatially according to the years they were founded. Lines from two campaigns to one organization (e.g. Engage or BlueLabs) indicate two founders on different campaigns. 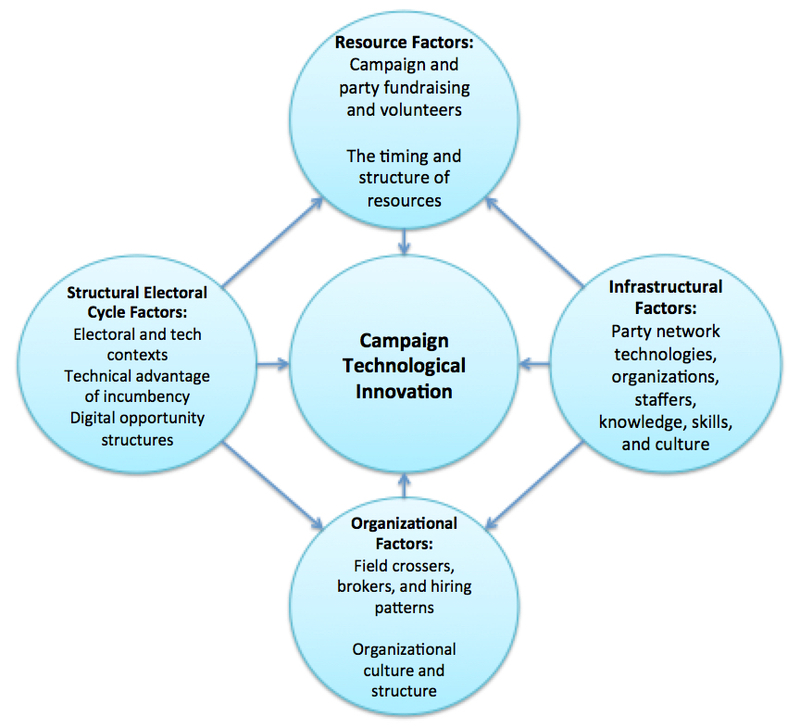 Structural electoral cycle factors are features of the environment that constitute the hands that candidates are dealt and shape the possibilities for campaign technological innovation. These factors include the broader electoral context, such as the state of the economy and the party in power, and the technological context, or the general state of media and technology. Structural factors also include what I call the ‘technical advantage of incumbency’, which grants some candidates more time to plan and develop technologies as well as coordinate with their political parties, and ‘digital opportunity structures’, those features of the political environment such as the field of candidates and strength of factions within parties that shape the possibilities for digital mobilization. Digital opportunity structures include the composition of the electorate, the issues favored by the political context, the relative power of groups in the party network, which party holds office, the issues the candidate is running on and the broader political culture, the candidate’s charisma (or public persona), the media habits of the candidate’s supporters and the ideological and party activists she appeals to, etc. Taken together, these structural factors also shape, but do not determine, the possibilities for gaining resources and hiring. Infrastructural factors refer to the background contexts of action that campaigns take shape within. These factors include the historically-constituted sets of resources that candidates assemble when creating their campaigns, such as party network technologies ranging from field tools to voter files. They also include the organizations, such as consultancies, that campaigns can turn to for technologies and expertise, as well as the staffers available to them with specialized skills in technology, digital, data, and analytics. These infrastructural factors shape but do not determine resources and organizational factors such as how campaigns value technology with respect to electoral strategy. Organizational factors include the hiring done by campaigns and their cultures and structures. With respect to innovation, what is important is the desire, effort, and ability of campaigns to hire staffers outside of the political field, such as in the technology and commercial sectors, who can bring new knowledge, skills, and technologies to politics. Importantly, the conflicts that may arise from “cognitive diversity” on campaigns have to be managed through the overlapping ties among staffers from different fields and brokers who can speak multiple languages and negotiate issues. Organizational factors also include culture, conceptualized broadly in terms of what campaigns value with respect to electoral strategy and how they adjudicate conflicts, and structure, which shapes the resources and autonomy technology, digital, data, and analytics staffers have to ply their trade. Resource factors include the money that campaigns and parties have to devote to technological development, and the volunteers that are essential to recruiting supporters and making voter contacts. Resources are shaped by the electoral context, the features of the candidate, and infrastructure (such as donor and volunteer databases and staffer expertise). Resources also matter with respect to their timing (the beginning of a campaign provides more time for investment) and the entities raising them (if fundraising is split with entities such as Super PACs candidates and parties have less money to devote to technological work). The monetary resources expended by campaigns during presidential cycles also have long term consequences, such as investments in party infrastructure that in turn benefit later campaigns.